Environmental Gurus may cry hoarse about the negative aspects of wind power generation, yet the fact remains that 87% of world’s student community, the community that will soon represent world opinion on things that matter, wants wind power to take the hot seat in providing cost effective electricity for all. True, wind power has a few disadvantages but that does not mean that it should be discarded as an unnecessary evil. Tell me honestly; which ground breaking technology is 100% perfect? Are antibiotics free of side effects? Will the recent air crash on the <?xml:namespace prefix = st1 ns = "urn:schemas-microsoft-com:office:smarttags" />Hudson River due to a bird hit jetliner prevent operation of regular commercial flights? No, the negatives of wind power, when equated against its benefits, stand practically nowhere. It may not be a good idea to install your turbine next to your neighbor’s bedroom but what is the harm in fixing it on the rooftop? Actually, wind energy or wind power, whatever way you may call it, is still suffering from its teething troubles. For instance, it has been ascertained now that the abnormally high number of bird fatalities at the Altamont Pass Wind Resource Area in northern California was caused not for the designing fault of the turbines working there but due to the faulty site selection. The turbines were installed along the path of a major migration route, and in an area where many raptors nest or roost. It was also attributed to faulty technology used during its construction. So you cannot blame wind power for this, but only the way it was applied. Opponents of wind energy often complain about the intermittent nature of wind that makes storage and distribution of wind generated electricity pretty uncertain. However, a stand by traditional power house can easily take care of such situations occurring for limited periods of time. One more problem that sometime comes up for discussion relates to transmission power loss when power generated in a remote wind park is brought to a location far away from the park. Curiously enough, the culprit in this case is neither the wind nor the turbine but technically unstable transmission line. Once this is taken care of, the problem will arise no more. As I said earlier, wind energy technology is still developing, and there is a lot of research and technology up gradations that are happening, and so we can expect that in the years to come, the problems related to wind power would be mostly resolved. Instances of turbines exploding and catching fire are nothing unusual. Perched high up in the air and spinning ceaselessly for hours together creates frictional heat in them, resulting in such predicaments. But the turbines can be redesigned and provided with enough lubricants for life. If a modern military jet can fly for innumerable nautical miles, even refueling in mid-air, there is no reason why a wind turbine cannot run its lifetime without additional lubrication. Why, even some of the moving parts of contemporary automobiles are grease-packed for life and are supposed to be replaced after expiry of their operational life. Redesigned turbines with nameplates signifying operational life will be hailed by all. After all, the majority of people living all over the world are desperately seeking wind generated electricity that will give them a new life in a lesser polluted planet. Despite a minority community advocating against wind power, there is now more than 60,000 MW of installed wind capacity in the world while most countries are active in developing wind power. Wind energy in Denmark and Germany has a 22% penetration level and in the US wind industry has grown at a steady 28.5% rate. Worldwide growth has also seen a similar trend, growing an average 31.4% per year (from records obtained during the last 10 year period) and the graph is reaching further heights every year. There is every reason to opt for personal wind power. Such a system can now be easily set up in your home. 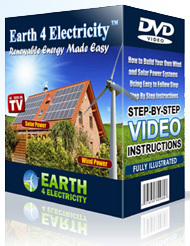 Yes cheap wind power is possible and it is hassle free as well. Plus you will be contributing to clean up the air and also saving on your power bills. You will just need to know where to set it up, how to do it, how to wire the system, where to get the parts from and of course the safety precautions that need to be followed.